With over 100 gas turbines cooled under its name in the Middle East alone, Araner boasts of capacity to implement a wide range of power augmentation and efficiency improvement projects. Some of the technologies popularly associated with the cooling solutions provider are Thermal Energy Storage Tank (TES Tank) and Turbine Inlet Air Cooling (TIAC). A good example of Araner’s prowess in these areas is the World Largest Thermal Energy Storage with stratified water (810,000 TR·h) in Middle East. That aside, the company is showing the way in the Oil & Gas sector, as evidenced in the Badra Oil Field situated in Wasit Province in Eastern Iraq. Badra Oil Field is a project by Russia’s Gazprom, the largest energy company according to S&P Global Platts ranking. Their activities revolve around exploration, extraction, production, transport and sale of oil and natural gas and so on. As the largest gas producer in the world, supplying most of the gas consumed in Eastern and Central Europe, the company is living up to its mission of ensuring a reliable, efficient and balanced supply of natural gas, other energy resources and their derivatives to consumers. For more about the production capacity of this company, please refer to our eBook. The Badra oil field development project is expected to complete in 20 years, but it could also extend by five years. The massive project comprises of a power plant for the process plant and Badra City power supply. To accomplish this aspect of the project, Gazprom needed a company experienced and well versed in power augmentation systems and the industrial refrigeration sector. Their aim was to not only optimize turbine performance, but also adhere to the increasingly tough Oil & Gas Standards. That is how they settled on Araner. It is important to note that the facility is so big that the design capacity of the gas plant is 1.6 billion cubic meters of APG per year. The target level of APG utilization at the Badra Oil Field is 99%. Araner proved to be the most suitable partner to Gazprom in the design and execution of this massive project. Experience in Turbine Inlet Air Cooling (TIAC) system and Thermal Energy Storage (TES) Tank, which together form a solution called TESTIAC, was exactly what this massive project needed. As explained in the eBook, gas turbines are turbo-machine and constant volume machines. In short, this implies that their power output is proportional to the mass flow of air/fuel through engine. The purpose of the design by Araner was to cool the turbine inlet air to improve power output and turbine efficiency. The location of the plant was in a dry area so the design also included a remote condensing solution. It uses no water so it suited the region’s high restrictions in water availability. Normally, site conditions do not remain constant. 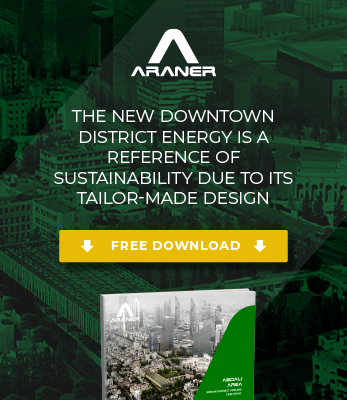 With this fact in mind, Araner designed and fabricated an ideal TIAC system. Analysis was based on different scenarios through simulation method. Araner executed the project in several phases namely Engineering Stage, Manufacturing Stage, Procurement Stage, and Skids Assembly Stage. The engineering stage was all about setting all aspects of the project with the involvement of the client. Araner believes in perpetual communication with client for successful project design, execution and commissioning. Araner designs and manufactures specialized equipment for the project. These include inlet air heat exchangers, Aradrop, industrial screw compressors and TES tank internals. We may not manufacturer all the equipment required for a project, so we had to procure some for the Oil Field project. For the Skids assembly, the client was pleased with the cost effectiveness achieved. Please check out the eBook to learn more about the modular concept and its application in this project. The results for the improvements at the Badra Oil Field are graphically recorded and are exciting to say the least. The client could not believe the improvements achieved for power output and efficiency with such low cost technologies. Grab an eBook for more about this renowned project.